During the last few days I’ve been struggling to work around something that seems to be a bug in SQL Server 2008 R2 Data Collector in a clustered environment. It’s been quite a struggle, so I decided to post my findings and my resolution, hoping I didn’t contend in vain. After setting up a Utility Control Point, I started to enroll my instances to the UCP and everything was looking fine. When an instance is enrolled to a UCP, the sysutility_mdw database can be used as a target Management Datawarehouse for non-utility collection sets, such as the built-in system collection sets. Actually, the utility database is the only possible target for any collection set, since the data collection configuration is shared between utility and non-utility collection sets. That said, I enabled and started the system collection sets and eagerly waited for some data to show up on the built-in reports. As nothing turned up, I checked the data collector jobs and they were executing successfully, so the data had to be there, hidden somewhere. In fact, the data had been collected and uploaded successfully, but it didn’t show up in the reports because of the way the data source had been registered in the Management Datawarehouse internal tables. A quick look at [core]. [source_info_internal] unveiled the root cause of the issue: the clustered instances had been registered with the physical name of the cluster node and not with the virtual server name of the instance. The built-in Data Collector reports filter data in this table using the server name connected in SSMS, which is obviously very different from what found in the data sources table. For instance, when connected to the clustered instance VIRTUAL1\INST01, I didn’t see any performance data showing in the report because the data had been collected using the physical network name of the owner node (eg. PHYSICAL1\INST01). I know it may sound confusing at this point, so keep the following picture in mind while looking at servers and instances in the example. So, what was wrong with my setup? How could it be fixed? Nothing I tried solved the issue: every time the upload jobs ran at the enrolled instances, the wrong instance names turned up in the data sources table. I suspect something was wrong in the Management Datawarehouse instance, since the same issue affected all the enrolled instances, no matter where they were installed. Question is I was unable to find a way to make it work. 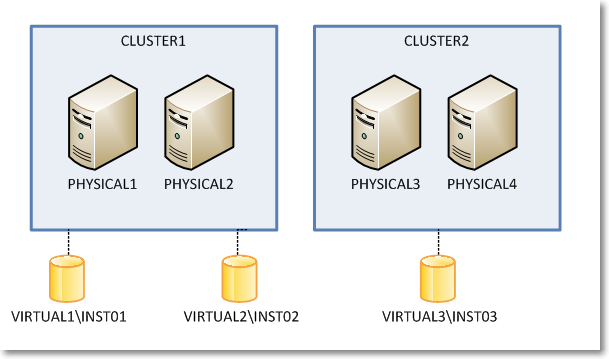 The only thing that worked for me was forcing SQL Server to understand what my cluster setup looks like and preventing it from using cluster node names instead of virtual instance names. As ugly as it can be, the only fix that worked was a view + INSTEAD OF TRIGGER combination. First of all we need some tables to store the cluster layout, with nodes and instances. And now the last thing we need to create is a trigger on the view, in order to control what gets written to the original table. With this in place, we should have only “good” server names showing up in the instance_name column. Obviously I don’t have access to the source code of the Data Collector, but I suspect it uses a component which is not cluster-aware (dcexec.exe) and for some reason it ends up using the wrong IP address to communicate with the management datawarehouse. I have nothing to support my supposition: it only seems reasonable to me and it resembles something I experienced in the past with non-cluster-aware services, such as the SQL Browser. Is this a bug? Definitely! Should I report it on Connect? Maybe: the results with past items are so discouraging that I don’t think I’ll bother taking the time to file it. It must be said that reproducing this error is not easy: any other failover cluster instance I have laying around was not affected by this issue, so I guess it’s an edge case. Nevertheless, worth fixing. Turns out that the whole problem arises ONLY when a proxy account runs the data collection job steps. 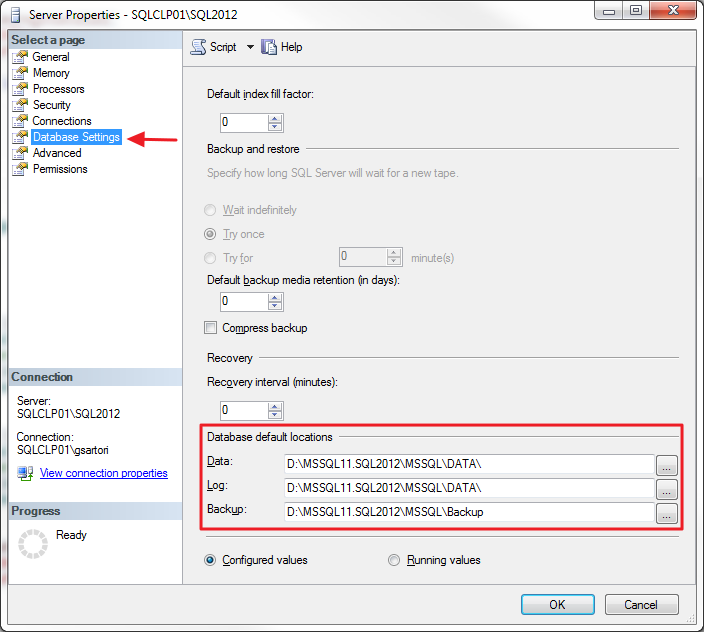 If the job steps are run impersonating the SQL Server Agent account, the error doesn’t turn up. I suggest this solution rather than the complicated view/trigger solution proposed here.